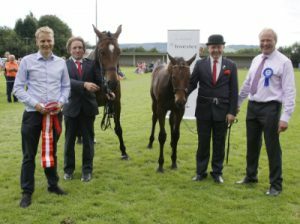 Congratulations to Kieran O’Gorman on his great win in the All Ireland Broodmare and Foal team championship. Kieran from Clonakilty in County Cork qualified for the final at Cork Summer Show in June. Sponsored by Investec Wealth and Investment, Kieran took the championship ahead of John Roche from Wexford in second place and another Cork man P. J. Lehane in third place. The winning mare ‘Brookfield Miss Lux’ was bred by Kieran himself. She is by Lux Z out of a mare by Cavalier Royale. Her colt foal is by Munther. This is a team competition as the mare and foal are judged as a unit. The judges put slightly more emphases on the mare. Congratulation again to Kieran and many thanks to Wealth and Investment for their very generous sponsorship.